Decent .223/556 bolt action rifle under 400.00? Thread: Decent .223/556 bolt action rifle under 400.00? Is there such a gun? Not in a hurry. Figuring early summer. I don't want an AR. I have my Ar 22's for making noise and spraying ammo lol. Want something for target. I have enough brass might as well start loading it. I would only recommend that you get a heavy barrel, even if you have to spend a little more. My Savage Axis HB Walmart special was just under $400, with scope (it works ok). If you can get one on sale or with rebates, the Savage 12FV at Cabellas. Cool good idea on the heavy barrel. I have a Savage Axis as well, very accurate and priced right. You might find a Rem 700 SPS for that or possibly a Ruger American. The Rem with a Bushnell 3x9 is $395 at my local Wally. A lot of people like the Savage Axis and the T/C Compass as well. The heavy barrel is nice on the bench but not necessary for accuracy. Awesome thanks. Our one walmart has a nice selection of guns. A few years ago, my Son won a .223 Axis @ a game dinner raffle ($20), and has been as happy as a pig in poop with it. He found it to be lightweight & accurate - what's not to like ? Cabelas periodically has a sale on the Rem 700 ADL with heavy barrel (in .223 and others). The regular price is$499. I forget what the sale price drops it to, but I recall it seemed reasonable. I picked one up in a 22-250 a couple years ago, but I had points built up and gift cards that made my out-of-pocket cost about $134. Nice selection so far thanks everyone. I always figured savage for a cheap accurate rifle with a good trigger. then later if you get more spare money replace the cheap looking plastic stock with say a boyds gunstock and a good scope and youd have a nice one. Yes agreed on boyds. They make some very nice stocks. I have a few that your looking for. The axis I got on sale with a rebate and have 217 in it. It is the most accurate of my cheap guns. 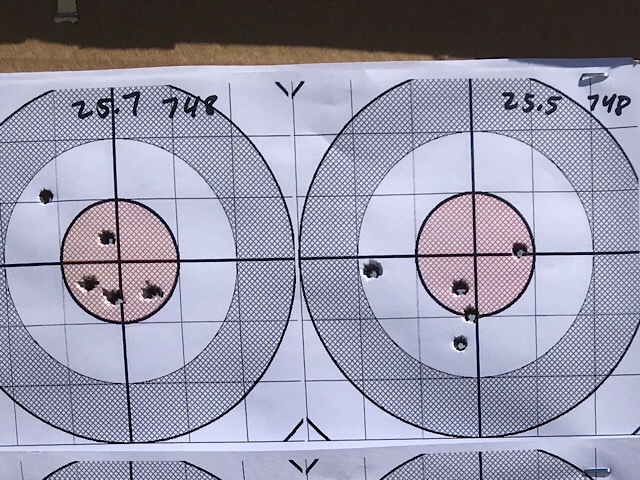 Will usually always shoot under 1/2in 5 shot groups at 100yds. 22.5gr of h322 and a 55gr v-max is the magic load. I have a TC compass also. It is a decent rifle. I got that for I believe the 280 range. It usually shoots in the .75-1.0 range with the 55gr v-max loads. Haven't worked too much with it though. I have a rem 700sps with a heavy 24in barrel. I have 350 into it. I have got much past barrel break in with it though. It too is .75-1.0 with the 55gr v-max loads. I do think there is more in both the TC and the Rem. Grabagun is a good site to keep an eye on. Kygunco is another. Gundeals is a good phone app with many good deals. As far as guns go, I've had great luck with savage. Most accuracy per dollar in my book. I think the rem700 is probably the best all around for build quality and accuracy. Axis is a little cheap. TC compass is a decent rifle but would be third of the 3 in my eyes. My rem is the only hvy barreled one. Barrel heat shouldn't be too much of an issue on a bench, unless it's really hot out or your in a dog town someplace. The rate of fire through one of these bolt guns barrel heat probably won't be an issue in 223. Pick them all up see what fits you best. Stopped in at Walmart today. They have a savage with wood stock for 347.00. It was tucked in the corner of the display. I'll check out the online sources too. Last edited by BigAlofPa. ; 02-12-2019 at 02:55 PM. Check out the Ruger American Ranch. I got the old one on clearance for $319. I can shoot just about 1.5 MOA with a cheap $30 3-9x40 scope and handloads of 55g fmjbt. Not bad for 16 cent rounds. A really fun gun. I would recommend the newer model that accepts AR magazines. The old model uses a flush mount 5 round mag and additional mags are over priced. With the new model, you can use 10,20 or 30 round mags. The Axis XP is also a great value. The current Cabelas/Bass Pro sales flyer shows the Savage 12VF (in .223) priced at $379. Just checked out local add. the 12vf is 349.00. But i don't have the greens yet. Think im going to with the axis 2 wood stock from walmart. I held it looked though it i like it. Fits me well. The best inexpensive rifle purchase for me lately has been the T/C Compass. After rebates they were $250 last year. With a $20 trigger spring kit they are a good rifle for the price point. Hi rsrocket1.As that rifle takes the 10,15 and 20 round AR type mags.I just wonder if it would accept the 100 round versions?One of them"Load on Sunday,and shoot all week" types . Sounds like you're settled in on the Savage, and I don't think you'll regret it. For the budget, I don't think you can beat it. Bought my son one in 7-08 a couple years back, loaded up a low-mid range 'starter' load for it, basically just to zero the optics, and it shot just a hair over MOA. Life happened, and we never pursued load development beyond that, but he's killed everything he's shot at with it since. Not bad for $349. One of these days we'll actually work up a load for it, and I'd be surprised if it won't be a .75 rifle...outta the box.